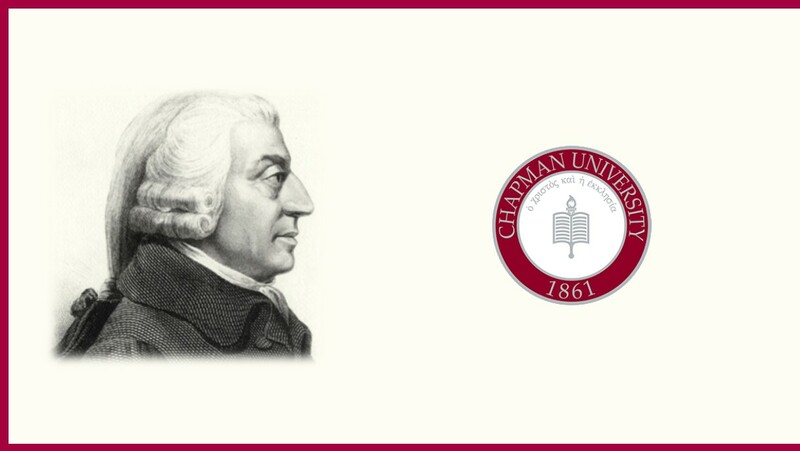 The Smith Institute for Political Economy and Philosophy is pleased to be hosting the 2019 meeting of the International Adam Smith Society at Chapman University's campus in Orange, California. We've put together an exciting program featuring some of the world's leading Smith scholars. The program will include keynote lectures from Professors Vernon Smith and Fonna Forman. Professor Smith is the 2002 Nobel Laureate in economics, author (with Dr. Bart Wilson) of the forthcoming book Humanomics: Moral Sentiments and the Wealth of Nations for the 21st Century, and a founding member of Chapman's Smith Institute. Professor Forman is an Associate Professor of Political Science at the University of California, San Diego, where she is the founding director of the Center on Global Justice. She is also editor of the Adam Smith Review and author of Adam Smith and the Circles of Sympathy. In addition to the keynote lectures the program will also include approximately two dozen plenary sessions and several author meets critics sessions for recently published or forthcoming books. The registration fee includes invitations to a banquet which will be held on Friday evening as well as a reception which will be held on Saturday evening. Participants are also strongly encouraged to join the Smith Society if they are not already members. Membership dues are quite modest and help the IASS support Smith scholarship through meetings like this as well the publication of the Adam Smith Review.